On the 28th of March, the tenth edition of the Forum for the Future of Agriculture (FFA) will be held in Brussels. 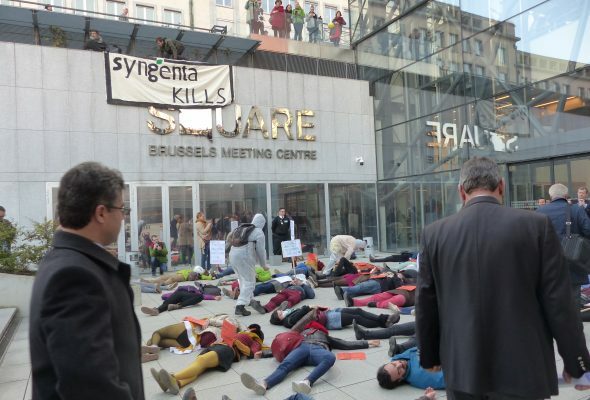 Its organisers, multinational chemicals and agrifood firm Syngenta and the European large land owners lobby organisation ELO will present their brand of agriculture, claiming it will meet food and environmental challenges. A coalition of farmers’ groups (members of La Via Campesina), civil society organisations and citizens have denounced these false agribusiness solutions and are issuing this appeal to send a firm message to the organisers and attendees of this forum: this type of agriculture has no future! With its tagline ‘where agriculture and environment meet’, the forum brings together a prestigious panel of speakers (EU, OECD, UN, etc.) alongside nature conservation NGOs and academics. But this façade of open debate conceals a costly exercise in political lobbying. At a time when the reform of the European Union’s Common Agricultural Policy (CAP) and the regulation of certain pesticides are under discussion, agribusiness players need to act now to protect their interests. So they present themselves as champions in the fight against global hunger and as leaders in environmental conservation; yet the solutions that they advocate are false solutions. Their answer to current and future food challenges is an unchanging litany: increase the productivity of farmland through technology and further reduce barriers to free trade. By asking the question ‘how to feed 9 billion people by 2050’, the FFA organisers are perpetuating the myth that we do not produce enough today to feed the human race. But according to the FAO we already produce enough food for 12 billion people! The causes of hunger and malnutrition are rather to be found in extreme poverty (especially in rural areas, where about 70% of hungry people live), food waste (30% of global production is wasted, according to the FAO) and the conversion of agricultural land to biofuel production and livestock rearing (feed and pasture). Lobbyists and multinationals sell what they call ‘smart agriculture’, which uses robotics, chemicals, biotechnology and specialisation. Yet it does nothing to feed those who are starving; instead it makes producers even more dependent on agribusiness multinationals. As well as their negative impact on health and the environment, these technologies are driving small farmers into debt and out of business. And there’s more. The way food is considered a simple commodity to be traded on the free market is one of the main causes of rural impoverishment and loss of biodiversity. Both in the North and the South, competition between farmers favours large farms at the expense of small farmers, who bear the brunt of the disastrous consequences of this model: falling incomes, unemployment, the disappearance of farms, massive debt, speculation on agricultural land and foodstuffs, etc. Over the last 30 years, Belgium has lost 63 percent of its farms – 43 every week. It is mostly small farms that are affected. The agriculture of machines, chemicals and international shipping cannot continue to exist without fossil fuels. Yet Syngenta claims to champion environmental causes. At FFA 2016, cuddly bees were distributed amongst attendees to promote initiatives that were far from transparent. The company probably wanted to deflect their attention away from its aggressive lobbying to overturn the ban on neonicotinoids – singled out by the scientific community for their disastrous consequences for natural pollinators such as bees and bumblebees. On its website, the company claims that opposing the use of GMOs, chemical fertilisers and pesticides means using more water and land. This is proof of its bad faith as it pretends to ignore solutions that have already been proven to be effective. The agriculture that agribusiness offers us is nothing new. It merely follows the same path that has brought about the destruction of our soils, the deterioration of biodiversity, the pollution of our waters and the disappearance of our farms. Truly smart agriculture, the agriculture of the future, should be modelled on natural ecosystems. A publication of the UN’s Special Rapporteur on the Right to Food states that agroecology could double food production in 10 years, mitigating climate change, protecting water resources and creating new jobs in the rural sector. Rather than surrendering agricultural production to the free market and the dictates of agribusiness, it is the people themselves who should determine agricultural and food systems. Only this way will they be able to have a healthy diet, tailored to their needs, locally produced and sustainable. That is why we believe it is essential to commit to food sovereignty. We do not want arms dealers calling the shots in times of peace; nor do we want dealers in poison to decide what we eat. They are only interested in making money. Their brand of agriculture is sounding the death knell for small farmers, consumers, and the environment. It represents the past. We want to send a clear message to European and international policymakers. They must curtail the influence of agribusiness and private interests and commit to the agroecological transition. We call on as many organisations and movements as possible to sign this appeal and to join us on 28 March. The statement can be signed by sending an email to manu[at]fian.be. A rally will be held on 28 March 2017 from 12:30 to 13:30 at the Mont des Arts in Brussels, opposite the square. On the agenda: speakers, farmers’ buffet, symbolic action.